My mum came in from the shops a couple of weeks ago. She was in a bit of a fluster. She had been picking up the bus in Partick and as she passed by the Salvation Army shop on her way to the bus stop her eye caught on something in the window. 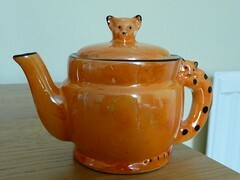 A little orange teapot with a cat on top. Nothing glamorous or expensive but when she was growing up she had one gifted to her exactly like that. She’d loved it but was upset when one day she came home to find her mother had sold it alongside some other trinkets she kept so she could buy more alcohol. She’s never talked about her younger days much – sounds quite tough. All these years later and here was a chance to get one like it again. I popped in to see if I could buy it but the way the Salvation Army work is they display soon to be sold stuff in the window – you couldn’t buy anything in the window until Saturday 25th. So over the last week my mum kept thinking about whether to get it or not. It was stirring some mixed memories for her. However yesterday morning she had decided to try and get it so we both headed down (in some awful weather) for the 9AM opening. There was quite a queue and just after nine the doors opened…and people started to rush in and I mean rush. We started looking and very quickly my mum saw it and grabbed it. It was in ok condition apart from a new looking chip and it was valued at the princely sum of £1.49. She actually thought of not buying it as she thought she was being daft. There was also a scratch on the side which she was sure she had done when she was younger, but she remembered it as being bigger. But that was something like 50 years ago. Anyway she bought it and we headed home. As you can see, it’s pretty simple and certainly wasn’t bought to be put on display. As my mum cleaned it up I heard a bit of a shriek from the kitchen. Asking if she was OK she shouted on me to come down. As she was cleaning the insides she spotted D.B on the inside of the lid. Her initials. 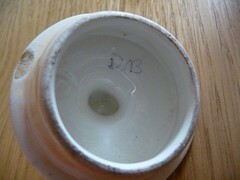 When she was young she had been told to write her initials on the inside or bottom of things so she wouldn’t lose them. Fifty years on, passing through god knows how many hands, the advice had finally borne some fruit. She was so happy – she had her teapot back. It’s not the size or value of gifts but sometimes the thought and story behind them that make all the difference. Most folk don’t need reminding of this. I certainly do. Got a tear in my eye, I have. Great story for a miserable Sunday night (weather wise and back to Aberdeen in the morning). Lovely story. If only that teapot could talk and tell it’s life story. Feel good story of the year more like! That is awesome. Going to send the link to Sally so she can have a cry.